So, you are participating in the Last Minute Elf this year. Or, at least you want to. And, since it is the LAST MINUTE elf, you are undoubtedly waiting until the last minute to get the work done, right? How about that finish? What can you use to finish your project to ensure that – you know – the recipient won’t need to clean his or her hands with mineral spirits after handling it? Yup, the Last Minute Elf week is in full swing, and we’re hoping that the spirit of the season is upon each of you and in your shops. 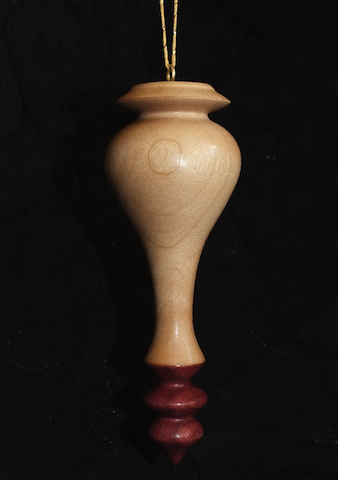 Yesterday, I posted an entry over at the Modern Woodworkers Association website about the meaning behind the gifts that we can build, and I hope you take the opportunity to read it. It’s not my usual funny banter, but more of a heartfelt look at the meaning behind what we build. We are also still looking for you guys to submit your entries for projects for the Last Minute Elf contest. 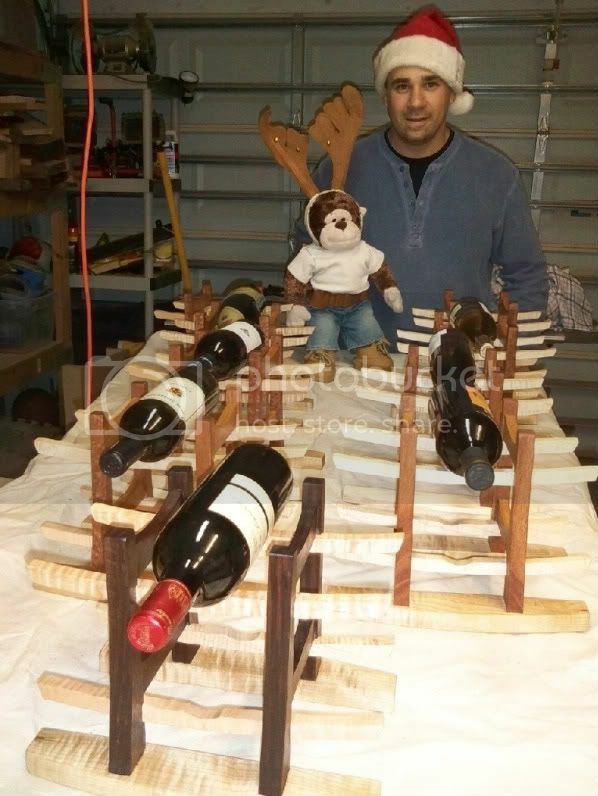 Submit some creative ideas for easy to build projects for the holiday season. We are looking for you to show off your absolutely awesome ideas for holiday gifts can can be built quickly, finished easily and shipped in time to make that special someone tickled to be the lucky recipient. If you think you can build something to fit one of these categories, we want to hear from you. Be sure to submit your entry – photos included – to iggy@tomsworkbench.com with the subject line that reads: Last Minute Elf Entry no later than December 28 (we figure that you will be rushing to get the project done by December 25 or 26, and will want to spend some time with your families instead of posting pics to us… thus, the extra days!). Once we get the entries, we will read the tea leaves and pick ourselves a few winners. 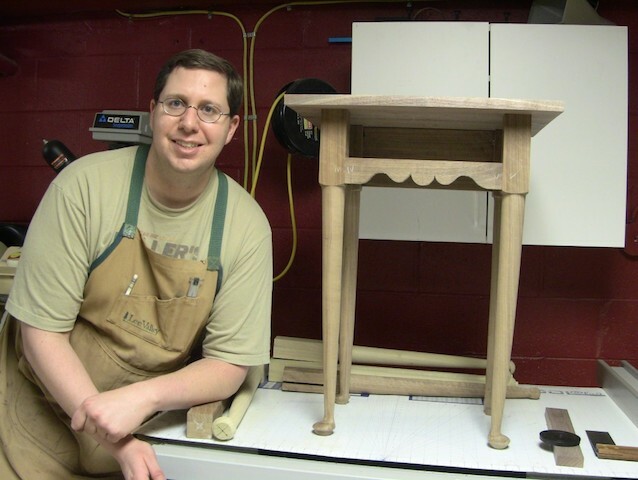 Be sure to check out the projects we will be posting over at the Modern Woodworkers Association webpage. Two years ago, it was an innocent suggestion by Shannon Rogers to get woodworkers involved in the season. And, this year, the Modern Woodworker’s Association is taking over the Last Minute Elf holiday build-a-thon, and I’m happy to be part of the effort. 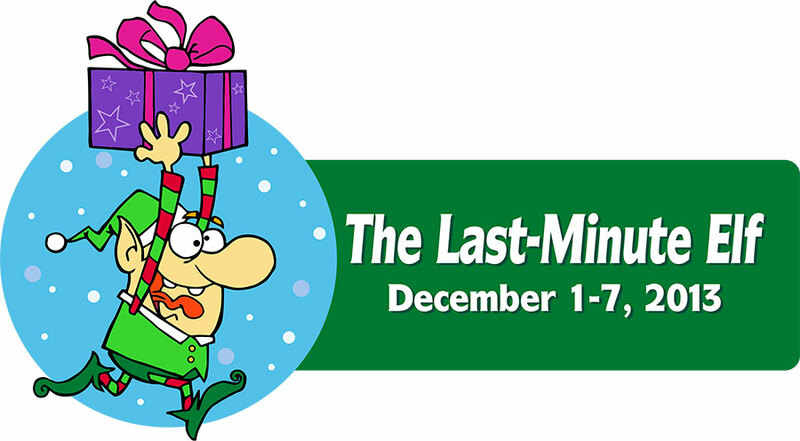 This year, mark your calendars for the week of December 7 – 13 for the fun. This year, we are looking for you to submit some creative ideas for easy to build projects for the holiday season. We are looking for you to show off your absolutely awesome ideas for holiday gifts can can be built quickly, finished easily and shipped in time to make that special someone tickled to be the lucky recipient. 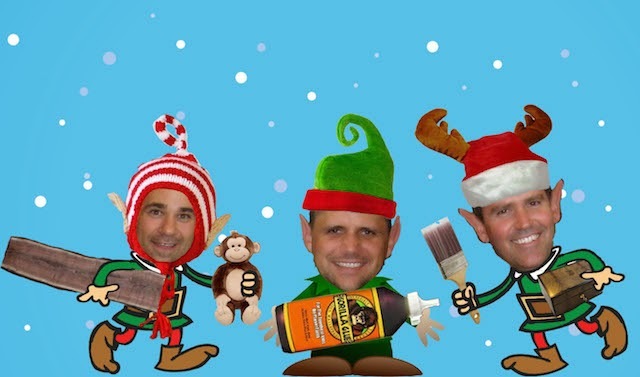 Believe me, these three elves are looking forward to seeing what kind of projects you are going to submit… and the best projects? They are eligible to win some sweet prized courtesy of the Gorilla Glue Company. So, let’s get in those shops and see what we can build! No, today is June 25. Yes, the 25th day of the sixth month of the year. What happens on the 25th day of the twelfth month? You got it. Noel – also known as Christmas. (Just where did the first half of 2014 get off to?) This, of course, also means that Hanukkah and Kwanzaa, along with every other winter holiday – is about six months away as well. Which means – you guessed it – it’s time to start the process of thinking about building holiday gifts. Now, I’m sure that most of us are probably thinking about summer vacations, but it’s my duty to remind you that – for many of us – our productive shop season is when the temperatures are warm and comfortable. When we have time to look at and evaluate dozens of potential plans. 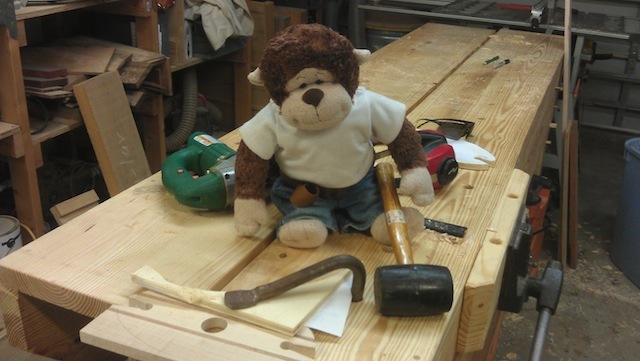 When we have the time to order not only the lumber for our gifts, but the appropriate hardware and tooling we are going to need to complete the job. Maybe even it’s a good time to develop those necessary skills that we are going to need to call upon at the last possible minute to pull the holiday miracle out of our hats. 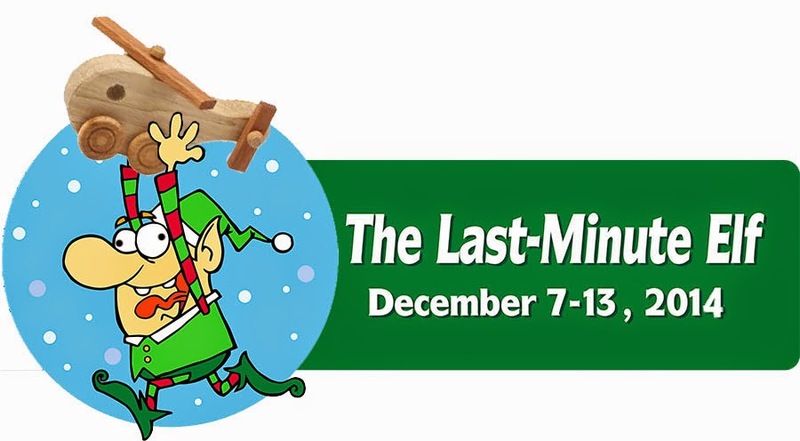 Well, my promise to you is that I will be holding the second annual Last Minute Elf week from December 7 through 13 this year, and I hope that this year’s event will be bigger than last year’s. For now, however, why not take a look at the entries from last year’s Last Minute Elf entries to get some good ideas of projects and finishes you might want to try in your shop this year. You know, to get ahead of the massive holiday rush, before it rolls up on you. 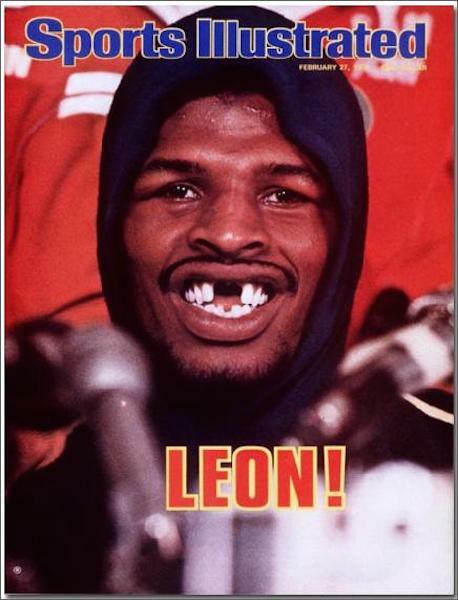 Until then, Happy Leon, everyone! Well, gosh, that went very quickly! It seems as if the week just began, and now, Iggy and I are sending all of you elves on your merry way. Hopefully, the projects we have featured and the links we have provide give you a bit of inspiration as you move ahead into the holiday season, ready to get to your workbenches and build something special for the ones you love. The only way you are going to get them built in time is if you actually get started. Never say that you can’t build something that will be good enough for your recipient. Over the past years, I have seen many people build awesome projects, but spend all of their time pointing out all of their ‘mistakes’ and belittling their work. Believe me, the only way the recipients are going to know about that tiny, microscopic gap is if you point it out to them. Just give them the present, shut your mouth and say, “thank you” when the recipient expresses his or her recognition. Now, if you will excuse me, I hear some of the power equipment running in the shop. I have to go see what Iggy is up to! 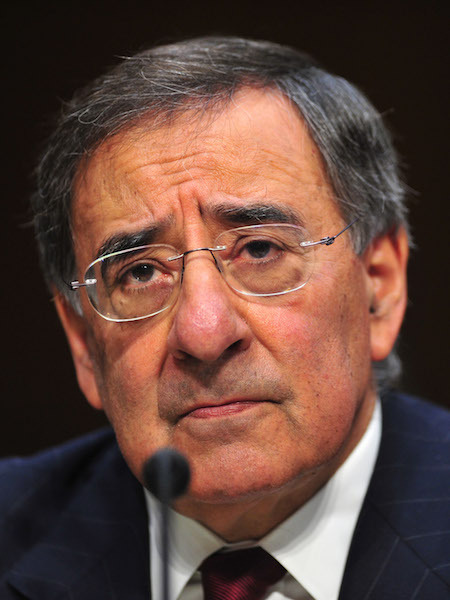 And, we even have some more links for you! 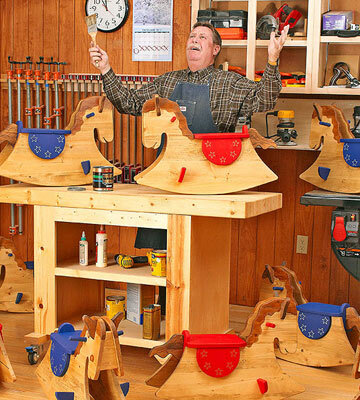 Woodworking for Mere Mortals: Clever and fun Christmas Gift ideas. 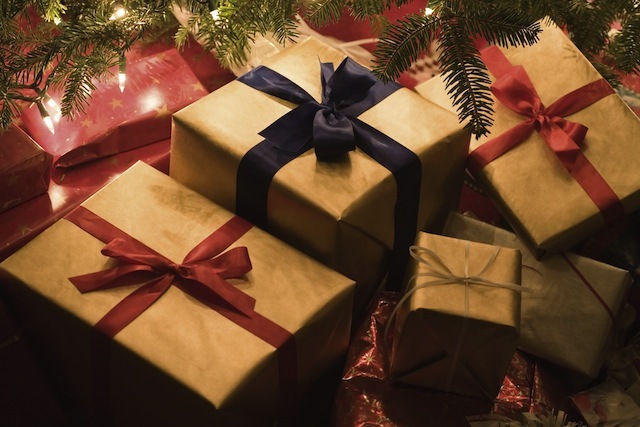 Being a last minute builder myself, I have run into many challenges over the years trying to beat the clock for holiday presents. I have had plenty of long shop nights, struggling to get everything done in time. 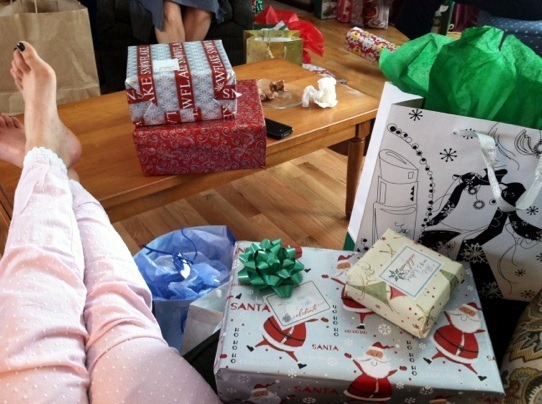 I have had to delay the giving of gifts because, well, they didn’t get done on time. 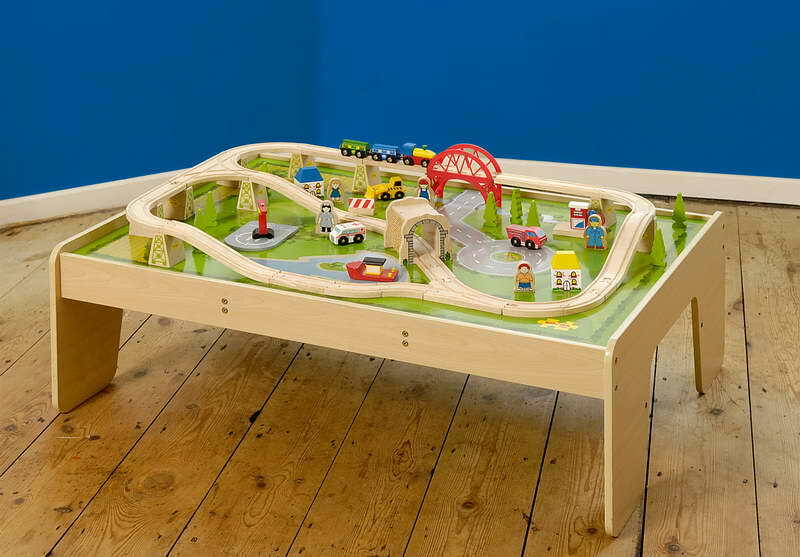 And, I can remember the one year that I was building a special train table for my nephew. 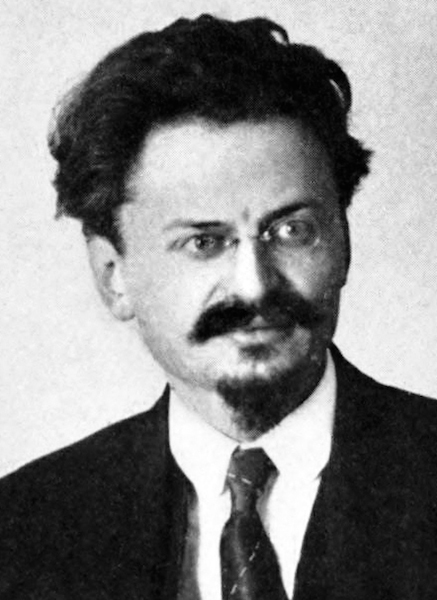 The little guy wasn’t all that old – maybe five or six. And, he loved Thomas the Tank Engine more than life itself. And, I made the mistake of promising my sister-in-law that I would build the table. Now, back then, my brother-in-law Larry was a much more accomplished woodworker than I was (he was the first of us to get a table saw), and had built a simple train table for his daughter. He showed me the rough dimensions of the project, and, well, I knew I could build it. Fortunately, it was easy to build with plywood. And, I was going to paint it, so some exposed sanded through plies or glue splotches weren’t going to be a big deal. I was well into the build when it hit me. The scratchy throat. The runny nose. Body aches. 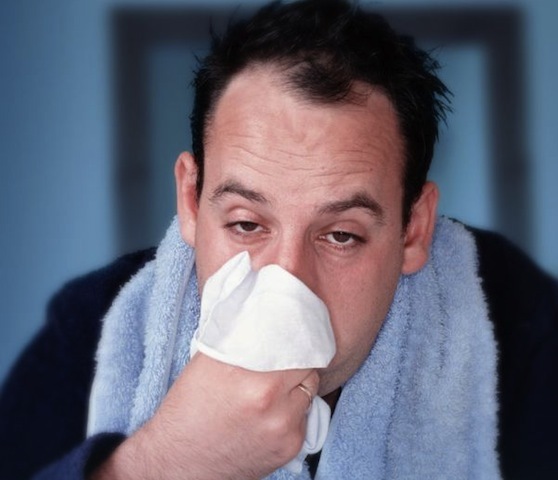 Soon, I was deep in the middle of a bad cold, coughing up a storm and running a fever. All I wanted to do was to lay on the couch and sleep, but my brain kept screaming at me to finish the table, because we were less than a week away from the holiday. I struggled through the rest of the build, stopping frequently to blow my nose, take more Advil and sit down when I felt woozy. Which was frequently. And, number two, I always plan to give a back up gift, just in case those last minute plans don’t work out. Just be sure to take your Vitamin C, eat well and get plenty of rest so you can fight off the bugs this holiday building season! Sticking with the train theme today, our winner for the Last Minute Elf building contest today is Chris Crozier. Those toy train toys are totally awesome for kids to play with, but, come on, what’s a train without a tunnel? I mean, you have to use that train whistle for something, right? 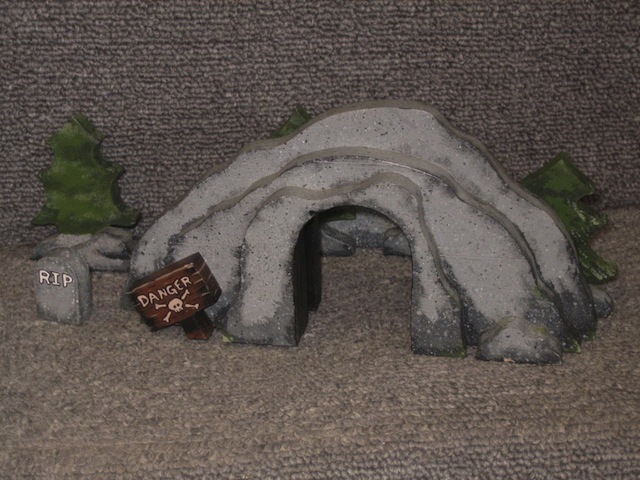 Chris was able to set up an Instructable on how to build this tunnel using basswood, although something like MDF would probably make for an interesting project as well. Chris, how about a pair of of 24″ Revo Jr. K-Body Clamps from the folks over at Bessey? They would make building your next train table scenery that much easier. Today’s articles? We got ’em! It’s a good thing that Tom has left me alone in the shop. Without having to stop to answer his inane questions, I have made good progress on the wine bottle topper. Which is good, because I have a feeling I may need to make a boatload of these babies. But, first, I did the smart thing. 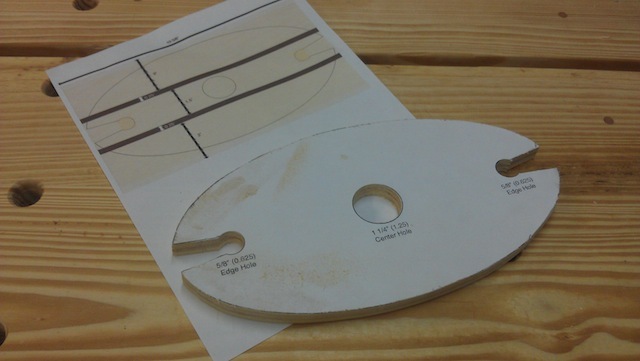 I took the plans that David Piccuito sent me and made a template out of some 1/2 inch plywood. I resisted the urge to just slap the pattern down on the workpiece because I wanted to have a nice pattern to rout to, if I wanted to go that way. Plus, it would be a lot more durable for when I’m cranking out those babies. 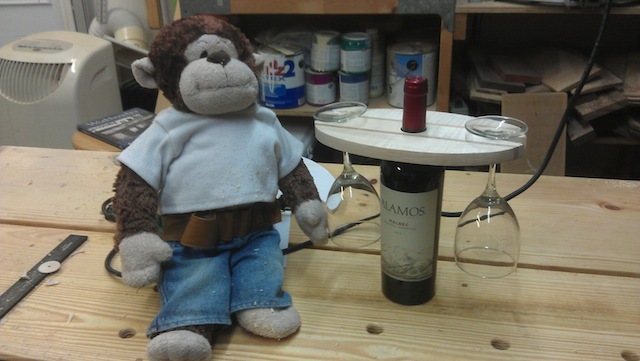 Once I traced the outline, I took it over to the drill press to make the holes for the neck of the bottle and for the wine glasses. With the right size forstner bits, it’s a piece of cake to get some nice looking holes. With this done, I turned to the jigsaw to make the cuts. With a good quality blade, it’s amazing how accurately you can cut with one of these. 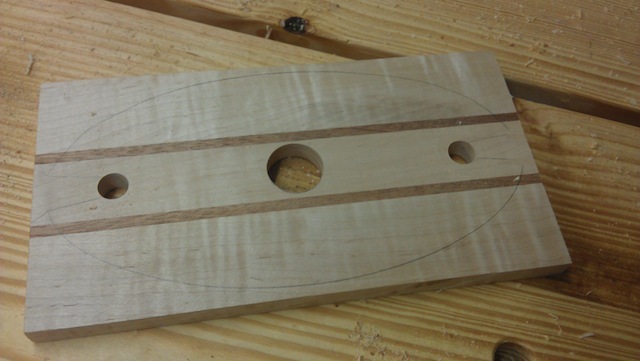 To snug the piece down for cutting, I used a holdfast in one of the new bench’s dog holes. Holds like a champ, and stays out of the way while I am cutting. The next step was to sand and round over the edges. After I did some work on it, I had to take it for a ride. I think the lucky recipient of this is going to be very happy! Today’s winner? Hmmm, let’s see… One skill I have always wanted to try, but have been afraid I might catch my tail on, is turning. Fortunately, Brian Benham has sent this entry for how to turn holiday ornaments. Using some glued up scraps, he was able to turn some sweet looking ornaments. Great work, Brian. How would you like a copy of Popular Woodworking’s DVD of editions from 1995 – 2012, plus a one-year subscription to their magazine? I think you may find some more ideas in there. Now, for today’s articles… how about these? 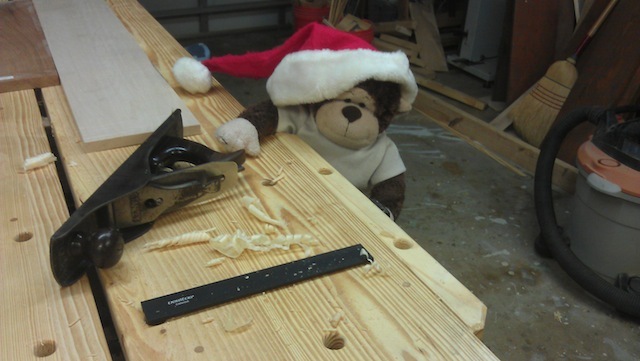 Brian over at Construction Boss has been working on a Christmas Workbench for his nearly three year old sons. 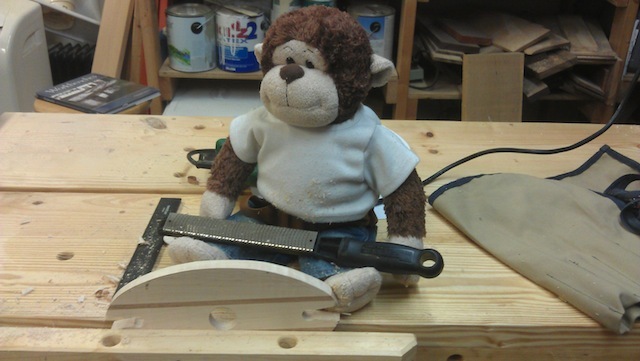 I have to warn you, the pictures of his son working in the shop are definitely hitting cute overload, so be prepared!